The lawyers' organisations in Quetta boycotted the court proceedings and staged a protest against what they called “holding of delayed full court reference”, at Balochistan High Court (BHC) on Monday. Some senior lawyers, however, participated in the full court reference to pay tribute to lawyers killed in the deadly suicide bombing at Civil Hospital Quetta on August 8 that killed more than 50 lawyers. "Why the full court reference was delayed in the memory of our martyrs," lamented Advocate Ghani Khilji, the president of Balochistan High Court Bar Association. The lawyers also chanted slogans against some senior lawyers during the protest. Brothers of slain senior lawyer Advocate Inayat Kasi lashed out at organisers of the full court reference. "This reference further harms us," Kasi said. 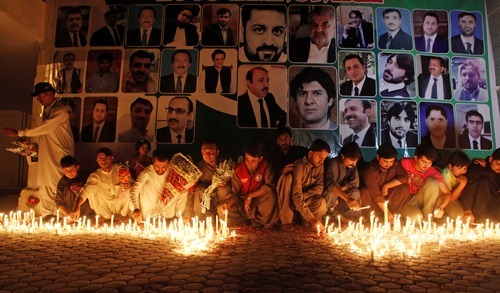 The lawyers complained that no progress was made in the investigations into the deadly suicide bombing in Quetta. Supreme Court Judge Justice Qazi Faez Isa, while addressing the full court reference, termed the killing of 56 members of legal fraternity in Quetta as unparalleled incident of killing academia across the globe. BHC Chief Justice Muhammad Noor Muskanzai and other judges also participated in the full court reference. Muskanzai said the terrorist incident almost killed a generation of lawyers in the province. He said, despite the odds, the members of legal fraternity were committed to uphold the banner of justice. The speakers paid rich tribute to fallen lawyers and vowed to continue their mission for rule of law and supremacy of Constitution in the country.